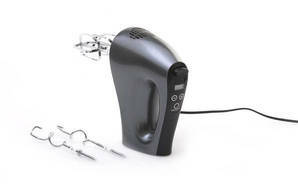 Snapshot: The Home & Co Digital Hand Mixer XJ-13407 has 10 speeds. How well does it beat and mix? Very good result for whisking. Stands steadily on the bench. No non-slip grip on handle. Controls are only Ok to use. Control on high speed is too strong. Lowest setting is too strong for gradual mixing.